Naturalized in South Africa and California (ARS GRIN). It was introduced to the northern hemisphere in the 1800s. It has a degree of frost tolerance and is adaptable to a wide range of soil conditions, so it has been grown in temperate regions around the world. It has naturalized and is considered a Category 1 invasive in South Africa (invader plants must be removed and destroyed immediately). Although it has also naturalized in California, it is not yet among the Acacia species that considered an invasive threat there by the California Invasive Plant Council. Outside Australia it has become naturalised in South Africa, Tanzania, Italy, Portugal, Sardinia, India, Indonesia and New Zealand (Encyclopedia of Life). This species is naturalised in south-western and southern Western Australia and in eastern Tasmania. It is also naturalised beyond its native range in some parts of northern and central New South Wales. Golden wattle (Acacia pycnantha) is most widely naturalised in Western Australia, where it is most common throughout the western wheatbelt and in the Darling Ranges from Perth to Albany. However, it has also been recorded further east near Esperance and inland near Kalgoorlie. In New South Wales it has been extensively cultivated beyond its native range and has been recorded as naturalised in several areas of the state. However, it is most commonly naturalised near Sydney in the coastal districts of central New South Wales. This species has also become naturalised in many other parts of the world, where it has been widely cultivated. Records exist from southern Africa (i.e. South Africa and Tanzania), New Zealand, Asia (i.e. India and Indonesia), Europe (i.e. Italy, Portugal and Sardinia), and the western parts of the USA (i.e. California) (Weeds of Australia Biosecurity Queensland Edition). Naturalized in South Africa and California (ARS GRIN). It was introduced to the northern hemisphere in the 1800s. It has a degree of frost tolerance and is adaptable to a wide range of soil conditions, so it has been grown in temperate regions around the world. It has naturalized and is considered a Category 1 invasive in South Africa (invader plants must be removed and destroyed immediately). Although it has also naturalized in California, it is not yet among the Acacia species that considered an invasive threat there by the California Invasive Plant Council. Outside Australia it has become naturalised in South Africa, Tanzania, Italy, Portugal, Sardinia, India, Indonesia and New Zealand (Encyclopedia of Life). This species is naturalised in south-western and southern Western Australia and in eastern Tasmania. It is also naturalised beyond its native range in some parts of northern and central New South Wales. Golden wattle (Acacia pycnantha) is most widely naturalised in Western Australia, where it is most common throughout the western wheatbelt and in the Darling Ranges from Perth to Albany. However, it has also been recorded further east near Esperance and inland near Kalgoorlie. In New South Wales it has been extensively cultivated beyond its native range and has been recorded as naturalised in several areas of the state. However, it is most commonly naturalised near Sydney in the coastal districts of central New South Wales. This species has also become naturalised in many other parts of the world, where it has been widely cultivated. Records exist from southern Africa (i.e. South Africa and Tanzania), New Zealand, Asia (i.e. India and Indonesia), Europe (i.e. Italy, Portugal and Sardinia), and the western parts of the USA (i.e. California) (Weeds of Australia Biosecurity Queensland Edition). Most of the areas where it is currently naturalized are represented by USDA hardiness zones in California (Cal-IPC). 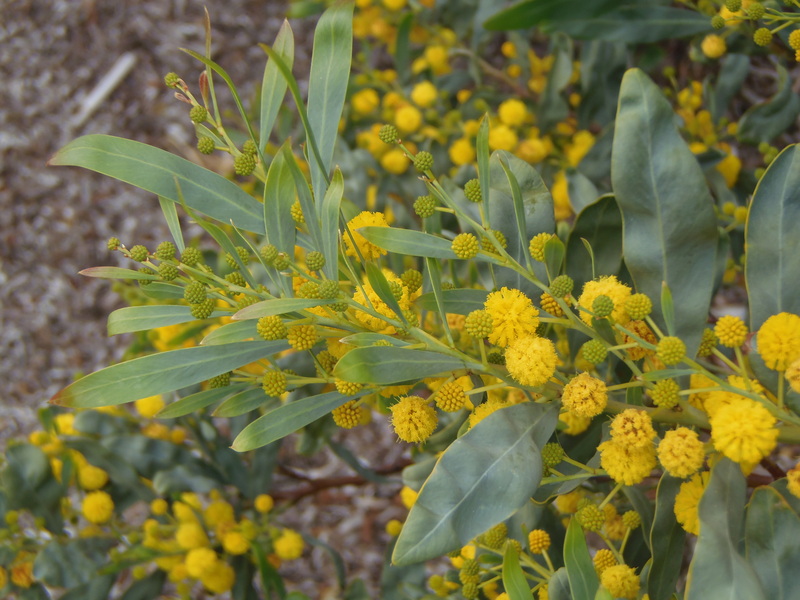 Golden wattle (Acacia pycnantha) is a moderately important environmental weed in Western Australia and Tasmania. It is also regarded as an environmental weed in those parts of New South Wales that are outside its native range. This species is one of the most weedy eastern Australian wattles in Western Australia. In the south-western parts of the state, golden wattle (Acacia pycnantha) is an abundant and increasing weed of roadsides and is also becoming invasive in nearby woodlands. In Tasmania, this species is widely recognised as an environmental weed originating from garden plantings, and is listed as one of the priority weeds in the Hobart City Council weed eradication program. It is also listed as one of four mainland wattles that are becoming bushland weeds in Tasmania and has been recorded as a weed in the Coningham Nature Recreation Area, south of Hobart. In New South Wales, this species is becoming a problem in drier woodlands in the wider Sydney and Blue Mountains region. Golden wattle (Acacia pycnantha) is also an environmental weed in South Africa, where it competes with and replaces indigenous species (i.e. transforms native vegetation). Dense stands are known to burn fiercely, which provides a further hazard for the indigenous flora and fauna in this country (Weeds of Australia Biosecurity Queensland Edition). Populations of Acacia pycnantha are invasive in South Africa, Western Australia and Portugal (Elucidating the native sources of an invasive tree species, Acacia pycnantha, reveals unexpected native range diversity and structure). Ndlovu, J., Richardson D. M., Wilson J. R. U., O'Leary M., & Le Roux J. J. (2013). Elucidating the native sources of an invasive tree species, Acacia pycnantha, reveals unexpected native range diversity and structure. Annals of botany. mct057. Golden wattle (Acacia pycnantha) is a moderately important environmental weed in Western Australia and Tasmania. It is also regarded as an environmental weed in those parts of New South Wales that are outside its native range. This species is one of the most weedy eastern Australian wattles in Western Australia. In the south-western parts of the state, golden wattle (Acacia pycnantha) is an abundant and increasing weed of roadsides and is also becoming invasive in nearby woodlands. In Tasmania, this species is widely recognised as an environmental weed originating from garden plantings, and is listed as one of the priority weeds in the Hobart City Council weed eradication program. It is also listed as one of four mainland wattles that are becoming bushland weeds in Tasmania and has been recorded as a weed in the Coningham Nature Recreation Area, south of Hobart. In New South Wales, this species is becoming a problem in drier woodlands in the wider Sydney and Blue Mountains region. Golden wattle (Acacia pycnantha) is also an environmental weed in South Africa, where it competes with and replaces indigenous species (i.e. transforms native vegetation). Dense stands are known to burn fiercely, which provides a further hazard for the indigenous flora and fauna in this country (Weeds of Australia Biosecurity Queensland Edition). Populations of Acacia pycnantha are invasive in South Africa, Western Australia and Portugal (Elucidating the native sources of an invasive tree species, Acacia pycnantha, reveals unexpected native range diversity and structure). Most of the areas where it is currently invasive are represented by USDA hardiness zones in California (Cal-IPC). A. dealbata is listed as a moderate weed (Cal-IPC), A. melanoxylon are listed as "limited" on Cal-IPC list; A. paradoxa is listed as "limited" by CDFA (Invasive Species List and Scorecards for California). A. dealbata is a weed in South Africa, which overlaps in climate with California. Multiple Acacia species are weedy in Sydney (Sydney Weeds). Many Acacia species are invasive in Mediterranean regions (Predicting plant invaders in the Mediterranean through a weed risk assessment system). Fourteen acacias are currently invasive in South Africa (The invasion ecology of Acacia elata (A. Cunn. Ex Benth.) with implications for the management of ornamental wattles). Gassó, N., Basnou C., & Vilà M. (2010). Predicting plant invaders in the Mediterranean through a weed risk assessment system. Biological Invasions. 12, 463–476. Donaldson, J. Ernest (2013). The invasion ecology of Acacia elata (A. Cunn. Ex Benth.) with implications for the management of ornamental wattles. Found primarily in California, Australia, South Africa (GRIN, EOL, GBIF). Grows best in USDA Hardiness Zones 8a-11 (Dave's Garden). These areas match the climate of California based on the Cal-IPC climate map (Cal-IPC). Golden wattle (Acacia pycnantha) is also an environmental weed in South Africa, where it competes with and replaces indigenous species (i.e. transforms native vegetation) (Weeds of Australia Biosecurity Queensland Edition). Forms dense stands at short distance, showing an impressive massive flowering at the end of the winter/early spring (Two alien invasive acacias in Italy: Differences and similarities in their flowering and insect visitors). Giuliani, C.., Giovanetti M.., Foggi B.., & M. Lippi M. (2016). Two alien invasive acacias in Italy: Differences and similarities in their flowering and insect visitors. Plant Biosystems - An International Journal Dealing with all Aspects of Plant Biology. 150, 285–294. Though plants are usually killed by a severe fire, mature specimens are able to resprout. Seeds are able to persist in the soil for more than five years, germinating after fire (EOL). Fire: killed by damaging fire does not regenerate foliage (Florabank). In South Africa, dense stands are known to burn fiercely, which provides a further hazard for the indigenous flora and fauna in this country (Weeds of Australia Biosecurity Queensland Edition). While germination of this plant is stimulated by fire, an exhaustive Google/Google Scholar search did not reveal any additional evidence about changes to fire regimes or promotion of fire, and this defaults to a “no” answer at this time. Although the seeds contain protease inhibitors, such compounds are common and can be deactivated by heat treatment or cooking. Acacia pycnantha is regarded as a promising species for the production of seed for human consumption. The seeds are reported to have been consumed by Aborigines in the southeast corner of South Australia and are apparently quite palatable. Gum was also a food source for traditional aborigines (World Wide Wattle). An exhaustive Google/Google Scholar search did not reveal any evidence of health impacts or impacts to grazing systems, and this defaults to a “no” answer at this time. World Wide Wattle (0). World Wide Wattle. Forms dense thickets (HEAR). Forms dense stands at short distance, showing an impressive massive flowering at the end of the winter/early spring (Two alien invasive acacias in Italy: Differences and similarities in their flowering and insect visitors). However, an exhaustive Google/Google Scholar search did not reveal any evidence of blockage of passage or production of impenetrable thickets, and this defaults to a “no” answer at this time. This species reproduces only by seed, which are long-lived and germinate readily after fires (Weeds of Australia Biosecurity Queensland Edition). Nil or negligible ability to coppice (Florabank). An exhaustive Google/Google Scholar search did not reveal any evidence and this defaults to a “no” answer at this time. This species reproduces only by seed, which are long-lived and germinate readily after fires (Weeds of Australia Biosecurity Queensland Edition). Flowers in late winter and spring, producing a mass of fragrant, fluffy, golden flowers. The bright yellow inflorescences occur in groups of 40 to 80 on 2.5–9 cm (1–3 1⁄2 in)-long racemes that arise from axillary buds. Each inflorescence is a ball-like structure that is covered by 40 to 100 small flowers that have five tiny petals (pentamerous) and long erect stamens, which give the flower head a fluffy appearance (EOL). Plants typically set seeds annually with very heavy crops being produced every couple of years; on average there are 33 000 viable seeds per kg. This species spreads by seeds which are produced in great abundance annually (World Wide Wattle). Forms dense stands at short distance, showing an impressive massive flowering at the end of the winter/early spring (Two alien invasive acacias in Italy: Differences and similarities in their flowering and insect visitors). Start producing seed at about 3 years old and become prolific producers of pods and seeds (Herbiguide). An exhaustive Google/Google Scholar search did not reveal any evidence regarding total seed production, and this remains unknown at this time. However, it is highly likely this species produces > 1000 seeds per year. Propagation is from seed which has been pre-soaked in hot water to soften the hard seed coating (EOL). Nicking or boiling the seeds in water for a minute at 100°C is required to induce germination (	Florabank). Scarify seeds (Dave's Garden). Acacia pycnantha is readily propagated from seed which requires a boiling or hot water treatment to break dormancy. Harding (1940) examined the effects of various boiling/soaking pre-treatment methods and reported that boiling for 5 seconds was more effective than for 2 minutes and both were better than no treatment (World Wide Wattle). The species flowers precociously (i.e. within 2–3 years of planting) (World Wide Wattle). It is quick growing and will often flower in the second season after sowing (Australian Native Plants Society). Australian Native Plants Society (2015). Australian Native Plants Society. Flowers in late winter and spring, producing a mass of fragrant, fluffy, golden flowers. Flowering usually takes place from July to November (late winter to early summer) in the golden wattle's native range; because the later buds develop faster, flowering peaks over July and August (EOL). In California, flowers in February (CalFlora; Jepson). Answered question No based on the information from California, despite the fact that it has a longer flowering time in other places. The fruit is a narrow and very elongated pod (50-140 mm long and 5-8 mm wide) that is hairless (i.e. glabrous) and somewhat flattened. These pods are straight or slightly curved and sometimes slightly constricted between each of the seeds. They are green in colour when young and turn brown or dark brown as they mature. When fully mature they split open along one side to release several seeds. The black seeds are oblong in shape (5.5-6 mm long) and have a somewhat shiny appearance. They also have a fleshy club-shaped structure (i.e. clavate aril) attached to them. The seeds are probably mainly dispersed by ants and birds that are attracted by the fleshy arils attached to them. However, they are probably also spread by wind, water, and in dumped garden waste (Weeds of Australia Biosecurity Queensland Edition). Dispersed by ants (PIER). Much seed is dispersed under the parent plant via gravity; birds disperse seeds, and ants may play a role in short-distance dispersal (PlantNet). Australian acacias are primarily dispersed via birds and ants (Reproductive biology and evolution of the genus Acacia). Tybirk, K. (1997). Reproductive biology and evolution of the genus Acacia. Bulletin of the International Group for the Study of Mimosoideae. 20, 45–53. The fruit is a narrow and very elongated pod (50-140 mm long and 5-8 mm wide) that is hairless (i.e. glabrous) and somewhat flattened. These pods are straight or slightly curved and sometimes slightly constricted between each of the seeds. They are green in colour when young and turn brown or dark brown as they mature. When fully mature they split open along one side to release several seeds. The black seeds are oblong in shape (5.5-6 mm long) and have a somewhat shiny appearance. They also have a fleshy club-shaped structure (i.e. clavate aril) attached to them. The seeds are probably mainly dispersed by ants and birds that are attracted by the fleshy arils attached to them. However, they are probably also spread by wind, water, and in dumped garden waste (Weeds of Australia Biosecurity Queensland Edition). An exhaustive Google/Google Scholar search did not reveal any evidence of frequent wind and water dispersal, and this defaults to a “no” answer at this time. The fruit is a narrow and very elongated pod (50-140 mm long and 5-8 mm wide) that is hairless (i.e. glabrous) and somewhat flattened. These pods are straight or slightly curved and sometimes slightly constricted between each of the seeds. They are green in colour when young and turn brown or dark brown as they mature. When fully mature they split open along one side to release several seeds. The black seeds are oblong in shape (5.5-6 mm long) and have a somewhat shiny appearance. They also have a fleshy club-shaped structure (i.e. clavate aril) attached to them. The seeds are probably mainly dispersed by ants and birds that are attracted by the fleshy arils attached to them. However, they are probably also spread by wind, water, and in dumped garden waste (Weeds of Australia Biosecurity Queensland Edition). An exhaustive Google/Google Scholar search did not reveal any evidence of frequent accidental dispersal via humans, and there are no mechanisms for attachment, and this defaults to a “no” answer at this time. Reviewed by Barb Castro and Elizabeth Brusati.